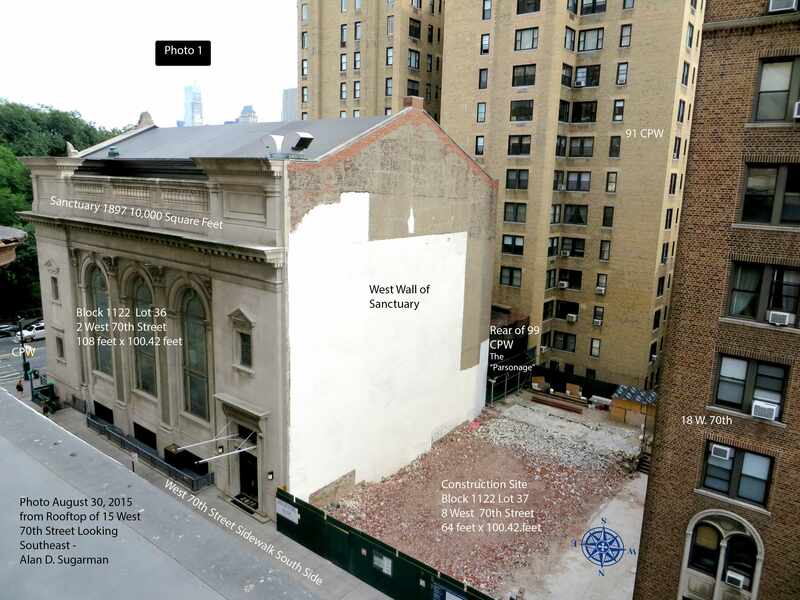 Congregation Shearith Israel – A Victory! Congregation Shearith Israel (CSI) is a powerful Upper West Side religious institution attempting to exploit the City’s zoning variance process to construct luxury condominiums as part of a new building that exceeds area height limit by nearly 100%—in a historic district, next to a significant landmark, on a low-rise rowhouse block with contextual zoning protections. On April 18, 2016, after nearly 15 years of challenges led by LANDMARK WEST! and others in the community, the New York City Board of Standards & Appeals (BSA) denied CSI’s efforts to proceed with its condo project. 2002-2008: CSI secured Landmarks Preservation Commission (LPC) and BSA approvals for a building that significantly exceeds “R8B” height and rear-yard setback limits designed to protect brownstone-scale midblocks. BSA approved CSI’s “hardship” claim that its “programmatic needs” (classrooms, etc.) required the extra space, even though more than half the planned building was devoted to luxury condos. May 2015: Department of Buildings (DOB) approved New Building permits for CSI’s project. Drawings obtained via Freedom of Information showed that the planned building had changed substantially since the BSA approval. For example, the classrooms—so crucial to CSI and its “programmatic needs”, the basis of its claimed “hardship”—had vanished from the plans. June 2015: LANDMARK WEST! and neighbors filed two independent Zoning Challenges on the basis of the significant discrepancies between the plans. June 2015 to present: CSI paid lobbyists Capalino + Company $75,000 to lobby city agencies on its behalf. October 2015: Four months after the two Zoning Challenges were filed, DOB finally posted one of the Challenges on its website, but remained silent on the other. A Notice to Revoke the permits was also posted online. December 2015: DOB finally responded to Freedom of Information requests filed months earlier, producing documents including email from Capalino staff to DOB requesting confirmation that the agency will “hold off revocation proceedings” while the architect continues with addressing audit objections. Also revealed is DOB’s December 10, 2015, letter warning that permits will be revoked in 15 days. March 2016: Five months after DOB stated its intention to revoke, permits remained in effect as CSI continued site preparations. March 30, 2016: DOB issued an order to CSI to “STOP ALL WORK IMMEDIATELY” due to conditions that present “imminent peril to life or property” (conditions that DOB allowed to remain unresolved for five months). April 18, 2016: BSA denied CSI’s application for “a letter of substantial compliance,” refusing to give CSI the green light it needed to proceed. It’s not glamorous, but this is a case study in what it takes to defend our neighborhood and save our city. Please click here for a FACT SHEET on CSI’s project.